Our accessories used for the production of toilet seats represent the best you can find in the market today. 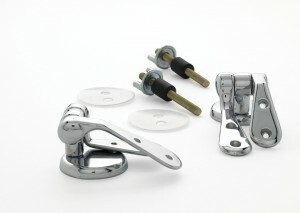 The hinges chrome-plated brass or stainless steel, the bumpers of all shapes and sizes according to the conformation of the TOILET board, the pins and screws IN stainless steel, are the most obvious signs of superior quality that represents our company. Moreover the use of boxes reinforced shockproof and the care taken in packaging safeguard product integrity by ensuring the safe transport from the customers.